1. When the guy working at the stand handed someone else their nachos he licked some cheese off of his finger right afterward and then proceeded to load up my nachos! Gross. 2. When my nachos were handed to me, I accidentally dropped them (maybe it was God helping me out by preventing me from ingesting some guys nacho spit). I told the girl also working what happened and she kindly made us a new platter herself. I don’t think she was a hand licker. The food was good, not great, but starved and exhausted it did the job just fine. The chips were store bought and the cheese tasted like it came from Taco Bell. It was probably melted Velveeta with some hot sauce added. The quesadilla was a bit better. It wasn’t greasy and the cheese looked and tasted real. The guacamole that came with it was the star of the show though. 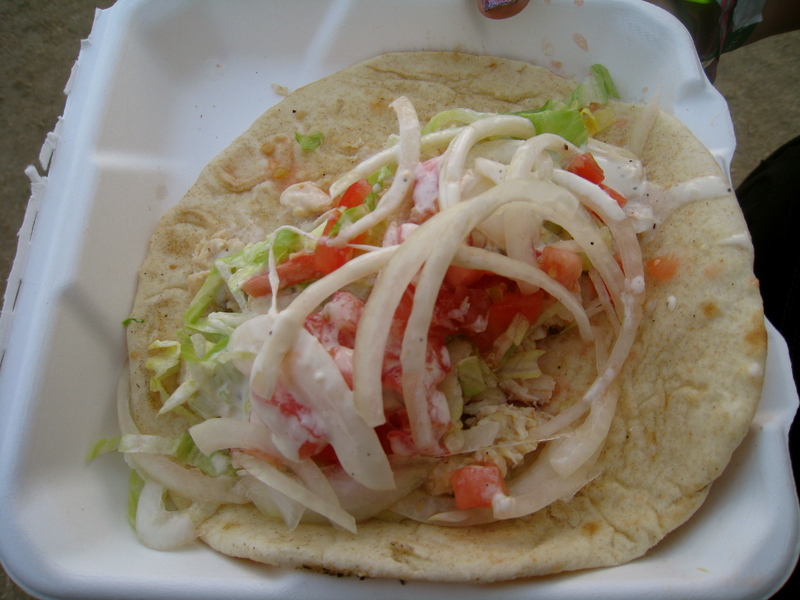 It had a firm consistency with little little chunks of avocado. Between the 2 dishes and 2 cans of Dr. Pepper that Heather and I bought our total came to $16 ($8 each). Not too bad. On the second day, most of us were craving something a little different. This is Celeste’s gyros wrap. It was $8 and a healthier option, stuffed with tons of veggies. This is Geno’s chicken strip and garlic fry combo plate. Sohini and Julio followed suit. All three smothered their dish in ketchup. I tried the chicken, it was surprisingly moist and meaty. It wasn’t nugget like either, you know, just a bunch of mashed up chick-bits. These strips were juicy pieces of breast meat. Yum yum for $10. Olivia and I opted for Indian on the second night. We both got the combo plate which consisted of a Veggie Curry (green beans, corn, and 5 kinds of mushrooms in a red curry sauce), Daal (red lentils in a red curry sauce), and coconut rice. Quite a bit of food for $9. 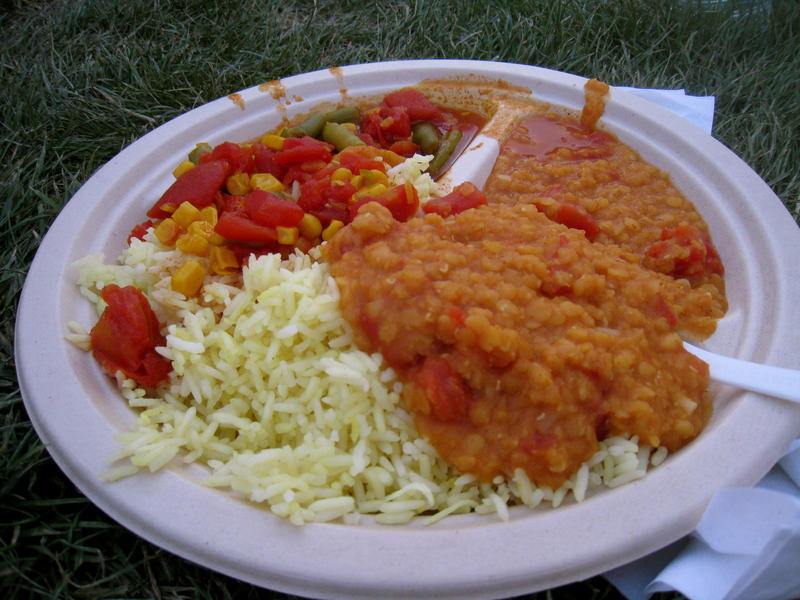 I was very surprised with how flavorful the curry and the Daal were, spicy and sweet at the same time. The lentils had an interesting texture alongside the crunchy veggies. My favorite part, the mushrooms in the curry. They had soaked up so much of the curry that they were void of their usual awkward texture. My least favorite part, the coconut rice. It didn’t taste like coconut AT ALL. My version of coconut rice is a 903472348273987324 times better. Now Heather, who is a vegetarian, got a Thai Stir Fry platter. 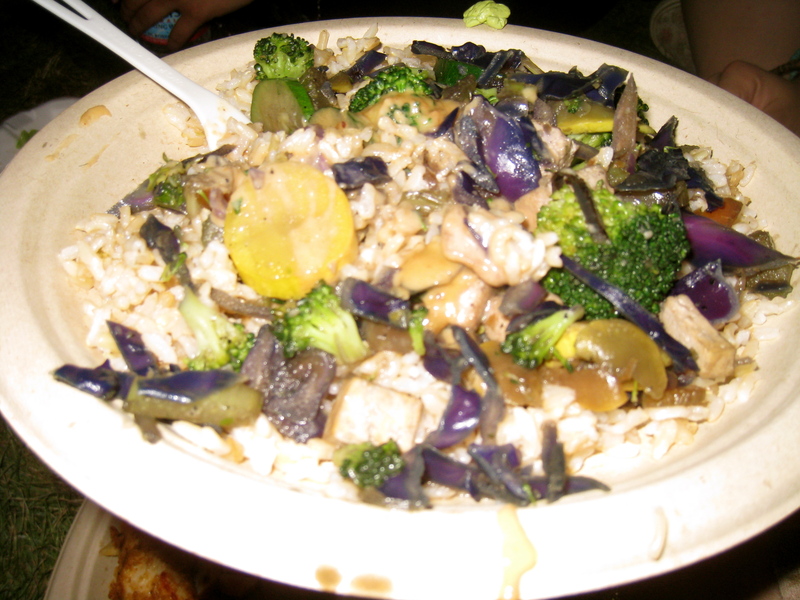 Full of brown rice, broccoli, and tons o’ other great veggies. This wasn’t the only meat free option, Coachella is really on the up and up when it comes to a variety of dietary options. Edith was the heavy hitter this night. She was the last to join the group in our pow-wow circle in the grass. We looked up to see her holding a 1/2 pound Polish sausage hot dog. Complete with grilled green bell pepper and onion. She applied the ketchup generously herself. After tasting it and then discovering it was only $10 I vowed to get it the next day. 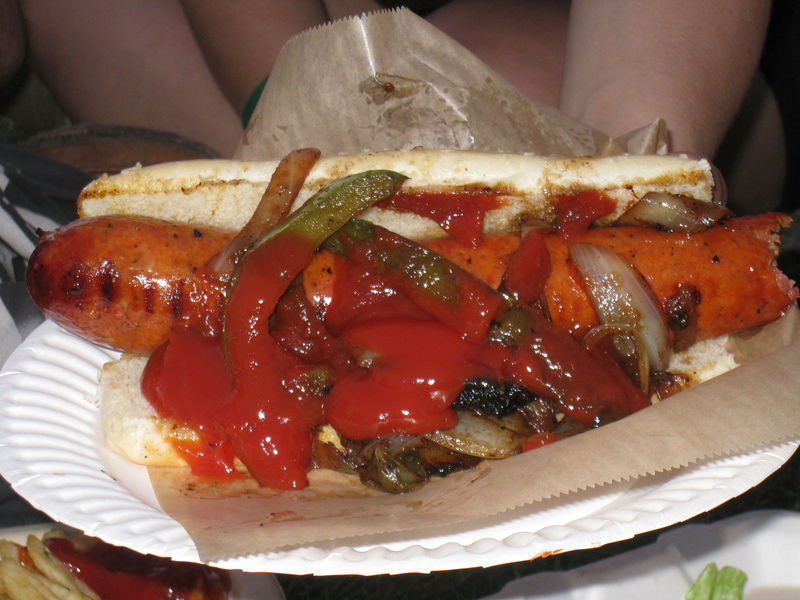 This hot dog was amazing, we all tried a little bit of it. Edith wasn’t able to finish the whole thing (which is probably for the best, we still had about 4 hours of music to listen to. Eating the whole thing would have put her out of commission for sure). To end off their respective meals Julio, Sohini, Edith, and Heather collectively bought this snow cone. The vendor’s stand was set up where the flavors were in containers in front of the stand so that patrons could choose their own combination’s. I tried a few mouthfuls and it was exactly what a person needs after a long day of dancing to the beat. I wanted to get one of these gigantic snow cones, but then I looked at my friend’s and came to my senses – it was just too big for one already full food blogger. 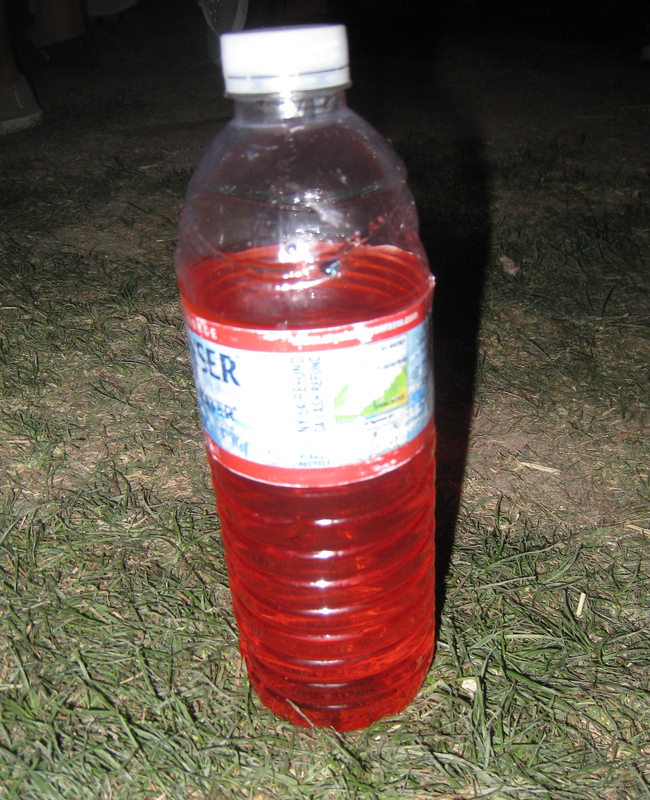 So instead Julio took my water bottle and gave it a splash of Tiger Blood flavor syrup. Perfection, it was just what I needed to get through the rest of the concerts. (Yes, I know I am a cheater. But it was only a small squirt of flavor. Don’t hate me). On our first night there while walking through the food area, Heather and I spotted Sohini and Geno secretively devouring what looked like an ice cream sandwich between 2 waffles. Let me tell you, they were not pleased we discovered their binge eating. The remnants of what they were eating though looked absolutely mouthwatering. I made a promise to myself and everyone else that we would all indulge in the treat before the weekend was done. Which brings me to our third and final night at Coachella. As I mentioned earlier, I vowed I would get a Polish sausage hot dog. Alas though, my sweet tooth trumps my hot dog tooth so I made a choice. I chose the ice cream sandwich-waffle combo. We all still wanted dinner too so we got up from our picnic table and began to all gravitate toward the same vendor. It was selling pulled pork sandwiches. We all got them. I got mine with cheese for an extra dollar bringing my total to $9 for some much appreciated moist pork. The sandwich was simple and to the point. And yes, I realize the picture makes it look unimpressive, but really it did look unimpressive. The taste was not however. Not by a long shot. I was happy it was rather small since I was saving room for the ice cream, but for $9 I wish I had gotten more for my money. Now to the good stuff. The waffle house that was selling the concoction we were all craving had the longest line out of any other stand by far. 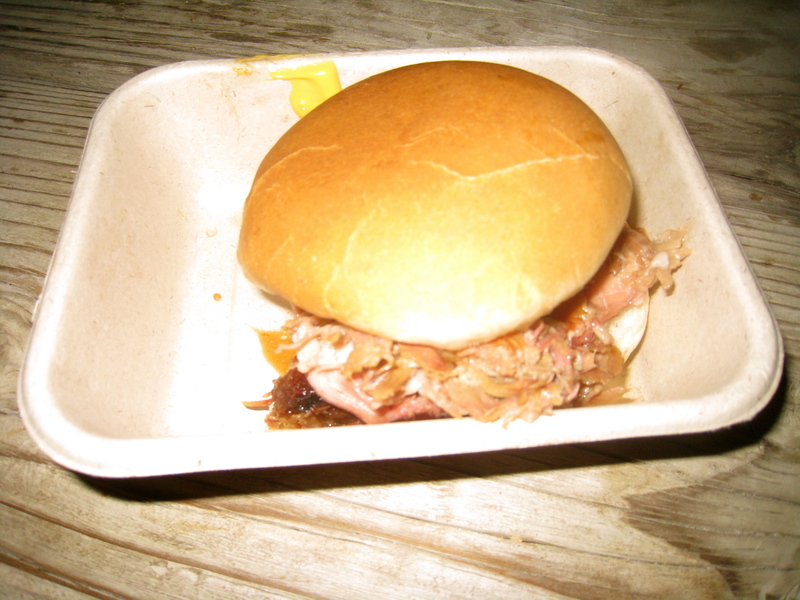 Their menu was also rather extensive compared to other vendors who only offered about three different items. The waffle house had about 9 options. After studying the choices for a minute we determined that since there were five of us who were to be partaking in the sweets we should get two. 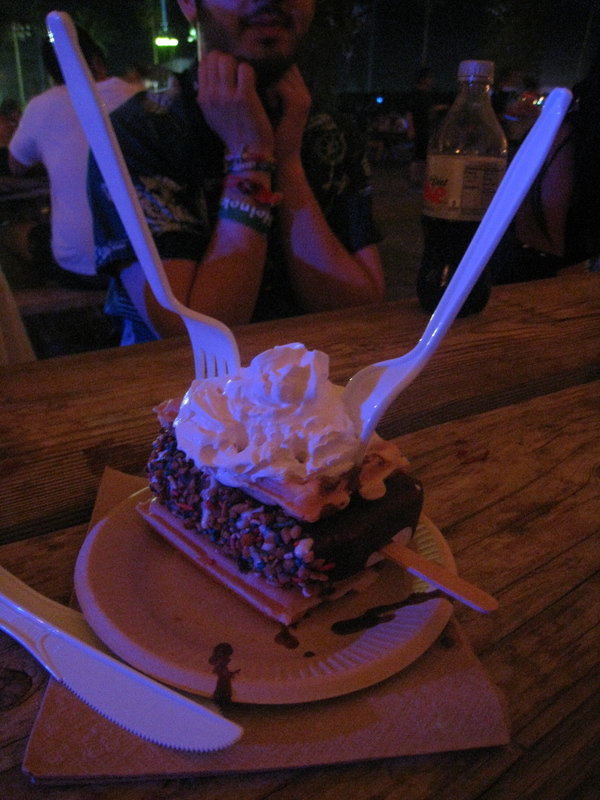 Our first selection was the chocolate dipped ice cream sandwich, rolled in sprinkles and nuts and wedged between two hot waffles. There was even a stick in the ice cream sandwich, which no offense, was pointless. How anyone could eat this thing off the stick is beyond me. I figured the stick was actually there because the cook had to dip it in the hot chocolate. 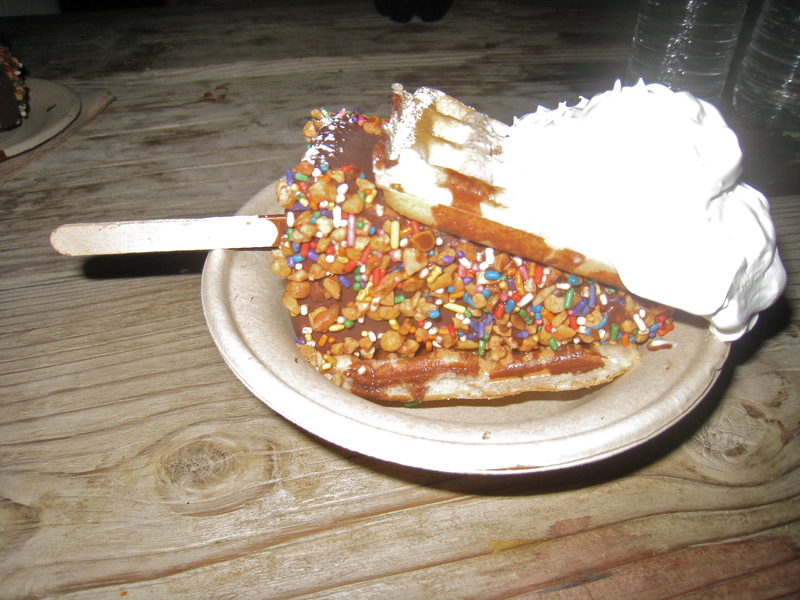 Next up, chocolate dipped cheesecake rolled in nuts and sprinkles and placed in between two freshly made waffles. Both our choices were of course smothered and covered in whipped cream. The total came out to be $15 for both items, split between five people, it was the best $3 I spent on the entire trip. 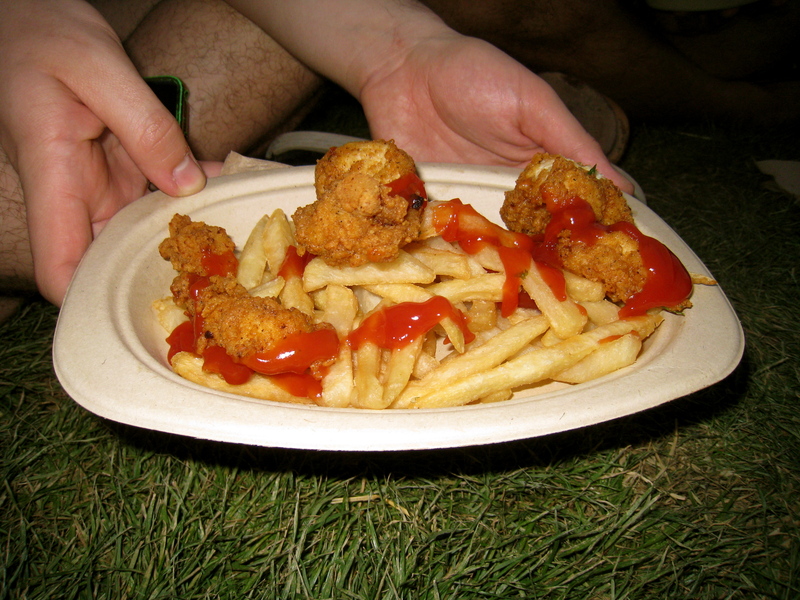 The most wonderful way to culminate my eating experiences at Coachella. These desserts were fabulous. The cheesecake was moist and the slice was thick. The ice cream was frozen and of the vanilla variety. 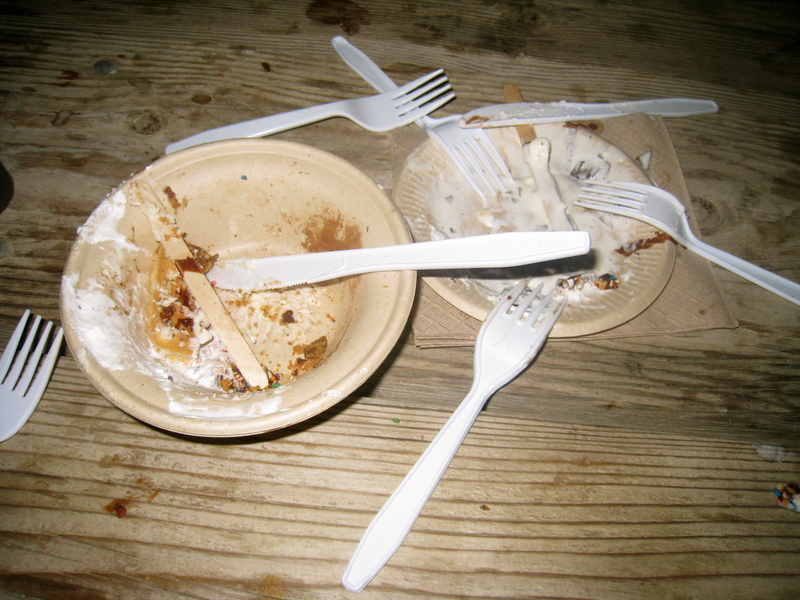 We finished everything in about 30 seconds. Ok just kidding. It took us about six minutes. Overall I was quite impressed with the meal options this year. It was pretty affordable for me, if I was going to eat more than once a day at the venue than I would have had more of an issue. The quality of the food far exceeded my expectations making the price a little more justifiable. I also caught wind that there was a stand selling hot dogs (and veggie dogs) cooked in a tamale. Both Celeste and Heather had one and said they were life changing. I must investigate further. 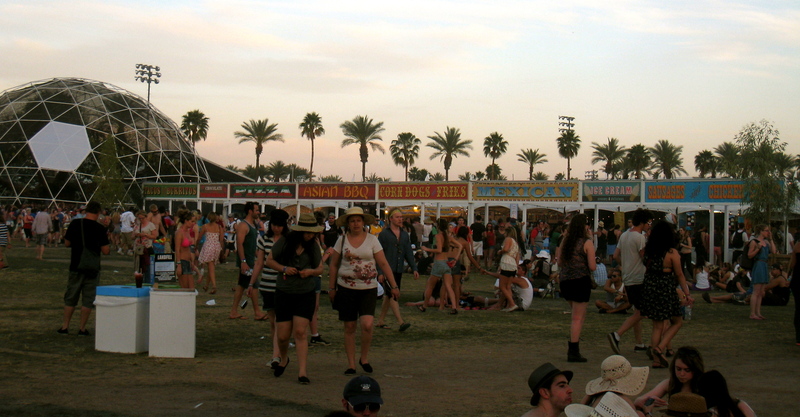 I guess we will see you next year Coachella. I am already anticipating next year when that Polish sausage hot dog and I can finally meet for real. 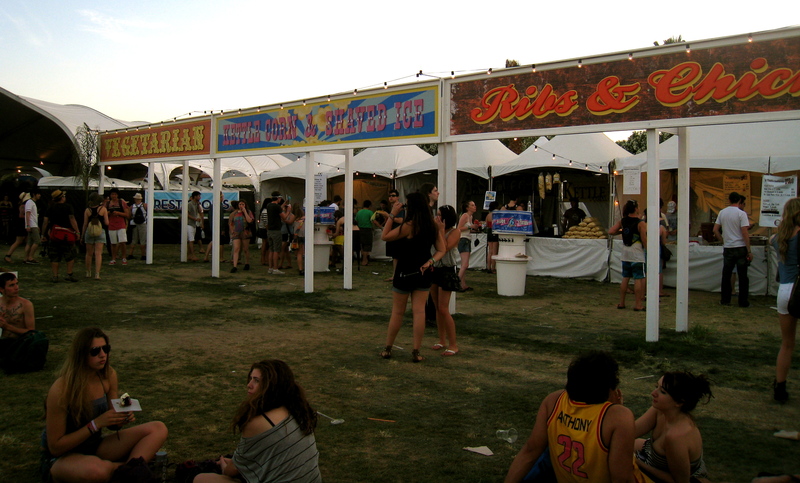 This entry was posted in Uncategorized and tagged better than expected, cheesecake, chicken, coachella, food, garlic fries, gyros, hot dog, ice cream, Indian, music festival, pulled pork, sandwich, vendors by kristinakerley. Bookmark the permalink. I can’t believe the world now knows that Sohini and I had the waffle two times that weekend!!!! I don’t think anyone will judge since you split them both times. Or at least not judge tooooo much!! !